Lindsay Rosset is originally from Brandon, Man., a city approximately two hours away from Winnipeg. A freelance photographer, Lindsay moved to Toronto after visiting her sister in Ontario’s capital. Drawn to Toronto’s multiculturalism, energy and urban life, Lindsay became instantly inspired by the prospect of personal and creative opportunity. She enrolled in Humber College’s Creative Photography program and after graduating in 2011, Lindsay has been working in the field ever since. 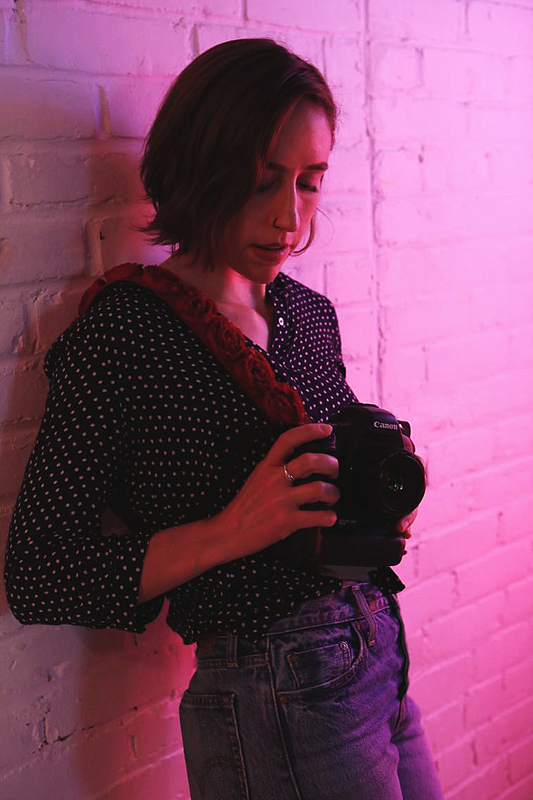 We connected with Lindsay to learn about the experiences that lead her to pursue a career in photography, as well as the lessons she’s uncovered since her big move. What was it like moving to Canada’s largest city? Moving shortly after graduating high school without a clear intention or plan was incredibly liberating. Living away from home for the first time, I was in a constant state of discovery – both with my external surroundings and internally. The scope of my world changed drastically and through new and challenging life experiences, I came to know myself in a way I had yet to. How do you think growing up in Manitoba influenced you to explore a creative career? Growing up in a rural community, my sisters and I were fortunate that our parents involved us in several activities early on in our lives. Gymnastics was something that quickly became a huge part of me and I dedicated most of my childhood and teenage years to it. Part of my interest in photography began while travelling with my team. I have vivid memories of the nagging desire to capture shared moments between us, with one of my first cameras always in hand. As I progressed as a gymnast, the sport became increasingly demanding of my time and energy, and my family and I decided to enroll me in a new school closer to the gym. Through some of my new classes, I began to further explore photography in the darkroom. Within a couple of months of attending my new school, I suffered an ACL injury during gymnastics practice, followed by a slow recovery. Eventually, I made the painful decision to quit. It was an incredibly overwhelming time to lose all that I had known, coupled with the stresses of being a teenager. In hindsight, photography became a cathartic form of expression while I was learning how to be without gymnastics or identifying as a gymnast. What motivated you to pursue the Creative Photography program at Humber? What was one of the most impactful lessons that you learned while studying? Studying at Humber taught me that schools aren’t flawless institutions and that they are ultimately businesses. I learned a great deal and enjoyed my time at school, but left feeling unprepared for the industry. Most of the work that showed up in my portfolio wasn’t necessarily a reflection of what we were taught. I acknowledge the limitations of formal education and, in the end, don’t regret my choice. Studying at Humber was the starting point that assisted me in getting my foot in the door. Is photography something you always envisioned for your career? Photography was always very meaningful to me but in considering it as a career, I struggled to envision how it could be feasible. Shortly after moving to Toronto, I remember making a very unpromising list of possible directions to take, and although it’s what I knew I wanted, photography wasn’t even on it. As an anxious person, I desperately wanted to want something safer, so I tried other things. Thankfully, none of them worked out. It took me a long time to finally accept that the uncertainty was a part of photography and of any creative pursuit – you can’t have one without the other. Since you graduated in 2011, what have you learned about the photography industry that formal education wouldn’t necessarily teach? Most of the important lessons I’ve learned have been through assisting other photographers. Assisting provides the opportunity to observe how others run their business, allowing you to choose what you want to apply to your own and how. Certain things like managing client expectations and asserting your own value can only be learned through experience. In my experience, the nature of the photo industry fluctuates between feast or famine – something that causes most people a lot of stress. I’ve learned to use the quiet times as an opportunity to work on personal projects, ones that may potentially generate future paid work. Especially in terms of assisting, quiet moments are also great opportunities to put out new leads and reconnect with old ones. Chances are, if it’s quiet on your end, others will also have the time and flexibility to meet with you. Networking is something that hasn’t come naturally to me and I resisted it for a long time. However, as a freelancer, I’ve learned that networking is crucial to your livelihood. In the beginning, I tried really hard to form a connection with everyone I met. I was in search of a mentor! Though my initial search lead me to some disappointment, I later realized that the journey was a gift that forced me to push myself further, creatively. I also learned that regardless of outcome, there’s always something valuable to take away from a meeting. If you had to write a tweet – so 280 characters – about your photography style, what would you say? Through photography, I aim to connect and find beauty in the universal human experience. I believe in the power of storytelling and am inspired by people, places and sometimes things. Often exploring ways to create authentic images with the hope that they speak to others. Why is working as a photo assistant something you continue to pursue? I’ve been very fortunate to work with some wonderful and talented photographers and through their generosity, I’ve learned many invaluable lessons. The progression from assisting to taking on my own clients has been incrementally gradual for me – finding my direction and voice has been a journey not short of disappointments or setbacks. It’s taken some time for me to recognize challenging moments as opportunities instead of failures. I continue to learn and work to embrace these moments through assisting and within the scattered but supportive freelance community. You’ve taken photos of your travels to New York and China, you’ve snapped portraits and you’ve partnered with Toronto’s Lorette Lingerie. What is the best part about showcasing different stories and brands through image arts? One of the things I love most about photography, the same can be said about travel, is that it has the ability to take you outside of yourself and the limits of what you know. It’s a tool to view different ways of life and the world. Photography has the power to bridge gaps by connecting audiences with people outside of familiar circles. In partnering with brands like Lorette Lingerie, I discovered how much I thrive on collaboration. This created an exciting and rewarding opportunity for me to help bring the Lorette Lingerie identity to life. Which brands do you hope to work with in the future? Why? I don’t have any specific brands in mind right now, but I’m very open and hopeful. I know I’d like to work with socially conscientious brands with shared ideals. I’m excited to see more local, ethical and progressive small brands emerge and find commercial success. Like most, I ultimately want to make a difference somehow and in aligning myself with brands that I believe in, there is potential for a positive influence to occur, however small. What has been the toughest part of this journey, working for yourself and producing empowering content? Overcoming self-doubt and having faith in the journey continues to be a learning process for me, one that is often heightened in the isolation that freelance work can sometimes create. These circumstances have taught me a lot about my personality, challenging me to accept my weaknesses as well as acknowledge my strengths. For most of my life, I identified my deeply sensitive nature as something to overcome, but through learning to embrace this quality, I’ve recognized it’s a strength that allows me to do many things, including creating meaningful images. How do you hope your work celebrates and honours what it means to be a woman? For far too long, women have been altered, objectified and dehumanized through media, disempowering us and breeding distorted self-image. Through my work that focuses on women, my hope is to combat these entrenched, harmful views by authentically capturing us. Women are diverse, forever evolving and undefinable, and there is a beauty to be found in each of us and our many facets. Being photographed is intimate and there is always a risk for a subject to face an excruciating experience, since the camera and photographer wield most of the power in the dynamic. My greatest hope is to create an empowered experience, a space to be truly seen and to inspire each other to embrace our full selves. Where do you go, or what do you do, when you need to reset and restart? I’ve found restorative yoga to be incredibly healing and a wonderful way to end a long work week. Being in nature, especially by water, is also a great way for me to reset emotionally and energetically. If I’m in need of some extra self-care and the budget allows for it, I might have some acupuncture done to realign myself or spend the afternoon immersed in the water therapy circuits at Body Blitz Spa. How would you rate the importance of self-care for a freelancer like yourself? I’ve started to really focus on self-care recently and have found it’s incredibly important for my well-being. As an introverted empath by nature and someone who struggles with anxiety, it often won’t take much for me to feel burnt out. Self-care has become a practice about listening and reconnecting to myself through all the noise of modern life and an effort to be mindfully present. When I’m in need of grounding, I’ve found that some of the things that work best for me are meditation, yoga, journaling and maintaining a healthy diet, as well as getting proper rest and solitude, especially following travel and socially demanding times. Do you have any advice for young photographers who are on the hunt for their next opportunity? Persistence is everything, put yourself out there as much as possible while continuing to work on your craft and exploring your personal interests. Keep an open mind about how or where work will show up. One of my first jobs came the summer following college, through a babysitting gig. The mother was an illustrator and textile designer who was in need of a photographer for her lookbook. Just moments after meeting her, she offered me the job. Say yes to all of the opportunities that come your way, even if you’re nervous. Each one is a lesson in gaining confidence as a photographer and will lead you to greater opportunities, if you’re willing to work for them. Lindsay, thank you so much for sharing your story with A Quarter Young. We can’t wait to see what the rest of the year has in store for you! Readers, for more information about Lindsay, follow her on Instagram and check out her website, lindsayrosset.com. The feature photo is by Olga Hutsul.